JOS CRISIS: GOC Explodes! – A Daily Collection Of Nigerian News Papers. * Jang admitted not calling me. 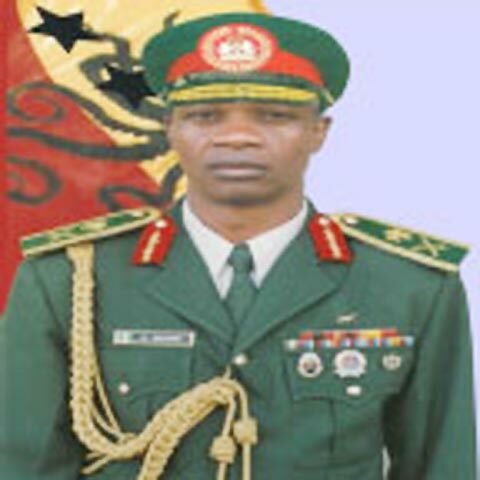 After about 30 years of service, Major General Saleh Maina, one of the finest Nigerian Army officer’s and the General Officer Commanding the 3rd Armoured Division of the Nigerian Army, was decorated with the enviable rank of Major General by the Chief of Army Chief, Lt. General Luka N Yusuf, on December 11, 2007 with the approval of the Commander in Chief. Recently, as GOC 3 Division, Maina has been in the eye of the storm. He has not only come under fire of the Christians and Muslims in Jos, once reputed as the nation’s most peaceful city. The Beroms, who pride themselves as the original owners of Jos and the Hausa-Fulani settlers who feel they have invested their livelihood and made Jos what it is today, hence they should be seen as partners in the progress of the State. Both feel General Maina is not protecting their interest. He has been called a killer, villain, supporter of Muslim against Christian, one who has asked soldiers to turn the other way when Fulani’s are killing Christians and one who has directed soldiers under his command to protect Muslims against Christians whenever Christians attack Muslims, thereby exposing Christians to Army gunfire. In this revealing interview with Saturday Vanguard at the Maxwell Khobe headquarters barrack of the 3rd Armoured Division, the General who taught in all the military institutions in the Nigerian military at one point in his carrier, bares it all about the Jos crisis. GOC, between January and this month, there have been two major crises first in Kurujenta where mostly Muslims lost their lives and Dogo Na Hauwa where Fulani herdsmen massacred mostly Christians and Berom indigenes. There are allegations that the Nigerian Army under your command, here in Jos, looked the other when the Fulanis were killing the Christians and Berom people. What is your response to this? That is absolute nonsense. Who made the allegations in the first place? I have always been a professional soldier. I have taken all assignments sincerely and with all seriousness. I do my job without any sentiments or negative sentiments whatsoever and I have the credentials to prove that. I took part in quelling the Maitatsine crises in 1983 in Maiduguri ; I oversaw the Boko Haram crises dispassionately in Maiduguri . 95 per cent or more of the victims of the Boko Haram crisis were Muslims and I am a Muslim and I did my job without any negative bias whatsoever. And same thing with the Kala-kato incident that took place in Bauchi last year. It’s the same thing with this one. at ground would I have taken sides in the operation. How? It is not possible. I don’t go down to start carrying a particular soldier or soldiers or group of soldiers to any particular location. The officers that did the deployment are Christians. If I may go further, I will tell you that my driver whom I have been with for the past three to four years, from Brigade Commander, Ilorin to Commander Armoured Corp in Bauchi to date, is a Christian and during this operation, we went to all the places together. My cook is a Christian. The boy taking care of my house, in fact, my own bedroom who knows my bedroom much better than myself, who knows where I keep everything including my money, is not only a Christian, he is from Plateau state. In fact, I didn’t know he was from Plateau state until I went for the burial of a brother of the Deputy Governor of the state at Shendam. My Personal assistant is a Christian. My Personal Secretary too, who handles my letters, open and reads my e-mail messages is a Christian. My orderly is also a Christian. So I don’t do my job based on or influenced by any form of bias or as you said taking sides. I am very, very disappointed by these allegations. Your religion is your personal business. Well, let them say it or ask them because I wouldn’t say I know but perhaps if you do some little research or what you call investigative journalism, perhaps, you will get all the answers. You know that Jos crises didn’t start today. It didn’t start on the 17th of January, 2010. I will stop there for now. GOC, Does it mean that they have no confidence in your leadership and are calling for your removal or your withdrawal of the military? Calling for my removal as GOC does not mean not having confidence in the military. The military is the backbone of this country and I will say of any country. Personally, I am just an individual, so anybody asking for my removal, perhaps the person should answer why. But I will like to state that the present GOC, that is my humble self, did not cause the problem in Jos and I will not be the solution to the problem in Jos. I am the 25th GOC since 1967 when 3rd division was created and headed first by Colonel Benjamin Adekunle. I am the 25th GOC in about 43 years, that’s an average of less than 2 years. In fact, there was a GOC that spent less than 3 months. So if you remove me as GOC, you will appoint somebody else as GOC. As I said, I am the 25th GOC in 43 years. Jos or Plateau State is just one of the states under your area of responsibility as GOC 3rd Armoured Division and knowing the military, you must have done some research or underground work when you took over. Why do you think this crisis persists? Well, I will answer you perhaps indirectly but most sincerely. I don’t want to be dragged into politics or making political statements. But the simple and true answer to your question is that those who should know, know exactly what the problems are or what the causes of the conflicts are. And nobody, I repeat, nobody has made any sincere effort to address any of the issues sincerely. That is why many of the conflict keep recurring, that is why the crisis keeps occurring. I want to commend Acting President Goodluck Jonathan for setting up the Solomon Lar Committee in the sense that that committee is tasked, I understand, I have not read their terms of reference, to identify the problems, advise government on how to resolve the problems and further than that, advise the government on how each organ of government, each tier of government as well as related organizations will carry out their roles specifically in solving the problems. If that Committee does its job properly and the government responds positively, by God’s grace, the problems will be solved once and for all. It requires sincerity of identifying the problems which I have said are known, sincerity in working out solutions which are very easy; because once you know the problems, you know the solutions and sincerity of purpose in working out the solutions, identifying which organization and which tier of government will carry out what role in solving the problem. As I said during my press conference on Thursday 11th of March, the governor did not call me, did not send me any text message neither did any of the government officials on impending attack on Dogo Na Hauwa and surrounding villages. At the same conference, I stated very clearly that the Governor couldn’t have told journalists that he called me because he did not. And I stated his credentials as to why I made that statement. That he was a former Governor of two states. He is my retired senior colleague and I am his subordinate and today he is the chief executive and chief security officer of a whole State in crisis. He knows he didn’t call me, he wouldn’t have said he called me and neither did any of his government officials. And I did mention the text messages that were sent to my officers, not to me, and there contents. The Dogo Na Hauwa attacks took place between 1. 30 am to 2 am in the morning and the first message my officers received about Dogo Na Hauwa was about 3. 41 am on that Sunday morning. And I read that text message, the three text messages, word for word to journalists. I was very disappointed that some part of the print media, misconstrued, misunderstood, misrepresented and misinformed the public and was apportioning blame on the military. As a matter of fact, on Monday 15th of March, I led a team of security officers to the Governor, and we discussed a lot of issues on how to go forward in solving the crisis and our operations, of which we are getting support from the government. There, the Governor reconfirmed, that he never called me and never text me any message on Dogo Na Hauwa, Rasat, Natum and other villages and he said that in presence of the Police Commissioner, Mr. Ike Aduba, in presence of the new Director of State Security, my chief of staff, my operations officer, my intelligence officer, and even my ADC was there. nd spoil the relationship that the Task Force is having with the State government in our collective efforts to enjoy peace in Plateau State. What is your personal relationship with the Governor? I have an official relationship with the governor and it is working well. We meet as often as possible. My officers are members of the State Security Council and where there is an issue that requires my being at the meeting, as happened in 19th of January, I attend. On the 17th February, I went to the Governor with my officers when the situation was about to degenerate, following attacks during burials. And as I said, on Monday 15th of March, I went to visit him and we had a very cordial relationship. We discussed the way forward in resolving the ongoing crisis. I am enjoying very good relationship with him at both personal and official levels and I am pleading with journalists not to spoil it. You said you were misquoted, misrepresented and misconstrued by journalists. Can you let us into the text messages you said your officers received? What I said that day was that I did not receive any text message or phone calls from any government officials prior to the attack on Dogo Na Hauwa, Rasat, Foru and Natum and I still maintain that. However, I mentioned that my officers received 3 text messages that night to early morning and I read them out, word for word. The first one that ever mentioned Dogo Na Hauwa was received at 19 minutes to 4 am and it says, ‘Reports Coming in, Fulani’s operating at Dogo Na Hauwa, Please Check’, that is what my officer received and this was at 19 minutes to 4. Meanwhile, our officers, on sighting a huge ball of fire on the horizon, shortly after 2 am, found there way with all difficulty at that night to trace Dogo Na Hauwa with troops. supposed to be commended for our initiative for on sighting fire in the middle of the night, our men rushed to the scene to do our best to arrest the situation and prevent further carnage. I am not aware of any at all. At the press conference that I had shortly after the military took over command of the operation, when we did the paper work on the 21st of January, I gave 3 telephone help lines through which anybody in distress, or with information should call us and these phone numbers were circulated and none of these phone lines received any calls, neither were calls received through any of the officers personal phone lines. We gave MTN, ZAIN and GLO phone lines. No officer received any of the messages you are talking about either through voice or text messages. And let me tell you, all the text messages, all the phone calls, all the distress calls we received, we reacted to all, even though more than 90 per cent of them turned out to be hoax and false. I kept a mobile reserve of 200 officers and men to react to distress calls. 200 mobile reserve, ready to go out at any time round the clock, and we have been responding, even up till last night, when somebody called that armed robbers were attacking the place and we went there, it was all false. The Police Commissioner has addressed a world press conference where he gave the figures that were finally interred. He went there with the coroner; they did everything they were supposed to do and arrived at the figure. As I’ve said he did his job professionally by involving a coroner and taking full records of what they saw physically. Regarding reprisal, I don’t know; I don know whether it was a reprisal attack or not. My job is to stop the mayhem, stop killings, stop the destruction, stop the threats to lives and property, arrest perpetrators, using any legal means, if it means using my firearms I use it. If it means using other means, I use them. I don’t want to be dragged into politics. In drawing out troops for Internal Security operations, like that of Jos for instance, was the proper procedure followed? Yes the normal procedure was followed to the best of my knowledge. At the highest level, if you didn’t see the paper work, at least, we all saw the Acting President on television telling Nigerians that he has authorized the military to take over the entire security operations to restore law and order in Jos and other parts of Plateau state. That is at the highest level. At my level, through the normal hierarchy, I got instructions, I got orders to take over and in taking over, the Assistant Inspector General of Police, Mr. Mohammed Abass who retired shortly after I took over Command of the operation, we did the necessary documentation, we discussed, we signed the papers in my office. We went to the Governor, we discussed with the Governor and his representatives signed the paper. So the normal procedure was followed to the letter. To the best of my knowledge, it was followed to the letter. Well, as I said. I am enjoying the logistics, administrative and moral support of my superiors, that is at Defence headquarters, Army headquarters as well as the Plateau state government, as far as the operation is concerned. However, we have four major challenges to our operation. . The first one is inflammatory or inciting statements by those who ought to preach peace especially in the prevailing circumstances. The second is the large number of unemployed youths who do not seem to be under any form of authority and who are very ready or willing manpower to cause mayhem. The third one is rumour mongering especially the very inciting messages that are sent using mobile phones. The fourth one is the press. Sometimes, I wonder if you guys are Nigerians. If only you know the level of damage you are doing to your country in an apparent attempt to discredit your armed forces. You do not see American journalists criticizing their military. Perhaps they criticize government policy but not it’s military. I told you earlier that I would not be dragged into politics or making political statements. The indicators perhaps came out in 1964, 1974. The situation really got bad I think in the early 90’s, 2001, 2004, 2008 to date. So the causes of the conflict are known. As I said earlier, the Solomon Lar Committee is working on it and I am sure if they work sincerely, they will bring these things out including the solutions and how to implement the solutions. I wouldn’t want to be dragged into that. How have your men been able to rise to the challenges the crisis posed. Well, so far we are doing the best we can. I just want to ask for the patience of Nigerians to understand the situation, what maintenance of law and order or internal security operations mean. Because a lot of people don’t have an idea. They think when you call in the military, then it is automatic, everything stops. It may not often be like that. The Kala Kato crisis finished within hours, the Boko Haram crisis took about 3 to 4 days. We thank God, when I arrived there ( Maiduguri ), within 30 hours, it was all over. That of Maitatsine took a few days. I am talking about the one that I participated. Well, this one has been recurring, that is why I said the problems are known and nobody has done anything, anything to address the issues. I feel very, very sad. Because like I said, there are lots of ignorance. Part of the earlier question that I didn’t finish was that in internal security operations, sometimes or more often than not, those challenging law and order, tend to have the initiative and that is how it happens anywhere be it guerilla warfare or sabotage. So you find that in a lot of circumstances, a lot of situation, you are responding. No matter how proactive you tend to be, you find that to a large extent, you are responding. So as I said, I am appealing to Nigerians to understand. Let’s take a look around the world, let’s not go too far. In Northern Ireland , the British forces have been there for more than 30 years. Even about 2 or 3 weeks ago, I think there was a bomb blast there. ty. So Nigerians should be patient, its not that you bring in the military and therefore everything stops, no. At this juncture, can we know about the person, Major General Saleh Maina? In one sentence, I am a patriotic Nigerian Army Armoured Corps Officer. Before I was appointed and took over as the General Officer Commanding 3rd Armoured Division of the Nigerian Army, I was the Commander Nigeria, Army Armoured Corps, which was the proudest moment in my career. But far back, I was an instructor at the Nigerian Defence Academy, Kaduna. I was a Directing Staff at the Armed Forces Command and Staff College , Jaji. From there I went to Ghana and I was a Directing Staff at Ghana Armed Forces Command and Staff College , Techie, Accra . When I came back in 1999/2000, I was made Chief Instructor at the Armed Forces Command and Staff College . what it means to make the sacrifice in the defence of this country. I recall that there was a time that I and my colleague were even abandoned in one of the objectives. Let me not sound as if I am trying to blow my trumpet. Anyway I want to say that I know what it means to carry out instructions and command troops in the defence of my country. I know what it means to bury the enemy and my own dead. I also have a Masters degree from the University of Ibadan in Strategic Studies. All together, I have put in more than 30 years of commissioned service without blemish for which I was awarded the Grand Service Star. I have other awards like Corps Medal of Honour and Foreign Training Assistance Medal. At the end of my meritorious service at the Ghana Armed Forces Command and Staff College , they awarded me with the meritorious honour of Dagger (+). GOC recently, there were some derogatory comments and insinuations made about your person following the outbreak of the attacks on villages. In one interview granted by General Bali, former Chairman, Joint Chiefs of Staff, he called you names. What is your response to this? Well, as a military officer, we have ethics and as young officers, we were taught to respect and look up to our seniors. I was a very junior officer, a Captain, going to Major when Bali was a 3-star General, so I cannot exchange words with him; it would be against military ethics and disrespectful to a senior General. However, I would like to chip-in a word of advice to our officers while they are in service. They should endeavor to prepare for life in retirement. This is a very patriotic career man and I wonder why anybody would want to destroy his career based on politics which he has no control over. I am a Christian and I don’t feel that it’s right for us to discriminate against Muslims, just like it’s wrong for Muslims to discriminate against Christians. This is one of the finest soldiers in the history of the Nigerian Army, well educated and able. He has reached his position on merit, not on Federal Character which we all hate. As much as we hate being cheated by Northern leaders and our own conspiring so called leaders in the South, please don’t let us paint everyone in the North with the same brush as we have true Nigerians in the North who have values (other than money) and love this country. Please don’t let us in the South be discriminatory and just as bad as the Northern leaders that we detest for their pulling this country back. Please leave this fine officer alone. He deserves to be where he is and there is no proof of him having done anything wrong. I do not imagine that Nigerians are a thankless people.We sure do appreciate our military.We appreciate our police and of course other uniformed services.We are abundantly grateful when they do a wonderful job. However my people say that the friend I asked to go hunting with me suddenly turns round and says that my legs look like those of an animal.In situations like that it is only fitting for me to be on my guard. The arrogance of men in uniform is really the issue.We understand that the job you do comes with its challenges, but so do all jobs.And of course we cannot be talking about which is more important because all occupations are mutually beneficial.People who face tough adversities in the discharge of their duties are usually given access to comfort by government as a kind of compensation. If journalists target the military baselessly, then we may be talking about weakening the force,but if it is a case of constructively engaging the defence forces, pointing out their lapses in the process, as a means of ensuring growth, then nothing seems wrong there. The military did us proud in Liberia,Sierra Leone, and a host of other places,and they were celebrated.But in Jos, truth be told,they were caught napping.The excuse of lack of operational command could be advanced as the reason the january riot happened ,but for those villagers to be murdered in their sleep when the special task force had been given control of security in Jos is fairly and squarely a failure of security leadership.Quite akin to the emperor fiddling while the empire burned.No quantity of semantics can change that fact. Unfortunately ours is a country where nobody ever accepts failure.Ironically, we do not realise that failure is human.America not only criticises her military but goes as far as putting them on public trial when necessary(remember Oliver North and the contra rebels case?). You are well-read,a professional and a fine officer,but in Jos you goofed Accept it and lets move on. There is this religion that clearly identifies itself anywhere in the world, with acts of terrorism, either as a group or individual, no matter their level of education and exposure! Your mental orientation about how long the killings in Jos should continue, worries me. It confirms certain anxieties some of us have that the Hausa-fulani want to make Jos a continuing war zone and in the process stall any developmental efforts. How on earth would you equate Jos( a city within a mostly peaceful country) to Northern Ireland or Afganistan which are war torn counytries. Is Nigeria a country at war? If this is the thinking from an officer with the kind of CV you portray, I have to say we obviously have no hope as a country. Must you hang on to the job? when will you accept that on this occassion, you have failed. I sugesst you return to the classroom. The British Made Jos what it is today not more than any other settler group. The first Governor of BenuePlateau, Joseph Gomwalk, had great visions for Jos and executed many of them before being killed for a crime he did not commit. The markets to which the Hausas derive their livelihoods have mostly been burned by their own very selves. Have you recently been to Bukuru? The Igbos have mostly been robbed and pushed out. Hausas now occupy their shops. If this is the type of trading you bring, take it back.